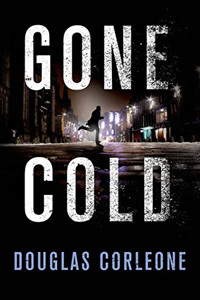 Gone Cold by Douglas Corleone: Synopsis and Online Purchase Options. Synopsis (from the publisher): Twelve years after a kidnapping destroyed former US Marshal Simon Fisk's family, he is newly determined to find the people responsible for taking his then-six-year-old daughter. He refuses to step away from the cold case, even after enduring months of dead ends and frustration. And then, at last, he gets a break. On a brutal January night, Simon finds an urgent message on his computer. Attached are two images: one, a computer-generated image of Hailey Fisk had she reached eighteen years of age; the second, a sketch of a young woman wanted for murder in the Ireland. There are striking similarities. Within a matter of hours, Simon is on a flight to Dublin, setting off to find a girl who may be Hailey Fisk-before she's arrested for murder. The chase will lead Simon through the UK and Ireland, where he learns secrets that have been kept far longer than the twelve years Hailey has been missing. It's Dublin where Simon hopes to find the people responsible for his daughter's disappearance and his wife's suicide. There he hopes to hold them accountable for what they've done. And, most importantly, it is there that Simon hopes to find Hailey, to bring her home once and for all.